Hampton & Richmond Borough were defeated in a match they started dominantly on Canvey Island, with John Sands netting a brace for The Gulls on his debut. The day saw plenty of rain in the morning, and several postponements up and down the leagues (even Concord Rangers’ home match was called off! ), but the pitch at Prospects Stadium was in fine fettle for the clash. And it was Hampton who started the brighter of the two teams, with Charlie Moone firing The Beavers in front after just six minutes. A fine move, one of many in the first half hour, saw Belal Aite-Ouakrim spray the ball out to Joe Turner on the right. Turner’s first time volley cushioned the ball perfectly into the path of Moone, and the club’s top scorer fired a first time shot through the legs of Canvey keeper Joshua Vickers. It was Charlie’s seventeenth goal already this campaign, and his eleven league goals make him the second top scorer in the Ryman Premier. The home defenders, and fans, felt there was a strong hint of offside about the goal, but it stood and Hampton were ahead. The Beavers dominated the opening exchanges, but were unable to add to their lead. Just three minutes after the goal, Karle Carder and Aite-Ouakrim combined well, before the ball was worked out to Turner. The winger shot, but a deflection looped the ball harmlessly into Vickers’ hands. It wasn’t until the 26th minute that we saw the home side have their first chance, John Sands firing wide, wasting a very presentable chance. Another good break from Hampton saw a pacey curling cross from Turner met by the head of Moone, but the striker’s glancing header went wide. The next chance again fell to Moone, this time a left foot half volley on the turn that went over the bar. The shot was the culmination of good buildup play involving James Simmonds and Aite-Ouakrim. If it was Hampton who started the first half the brighter, it was the home side who came out of the blocks quickest in the second. A long range shot from skipper Matt Game was straight at Chiweshe, but just minutes later they were in front. Sands hit a volley from distance which Chiweshe tipped away. However, the ball was put back into the box, and after an almighty scramble ensued, Sands smashed the ball home from close range to make it 2-1. Charlie Moone had a chance to equalise just before the hour, but he dragged his shot wide. Marcus Rose then almost gifted Canvey a third as his loose pass allowed Harrison Chatting a clear run on goal. As he bore down on goal, Chiweshe came out to meet him and close down the angle, eventually gathering the ball bravely at the winger’s feet. Warren McBean then got on the end of a cross from the right, but his header went straight to Chiweshe. Luke Wanadio, on as a substitute for Simmonds, went on a driving run and hit a powerful shot that narrowly missed the angle of post and bar. The last couple of Hampton chances fell to Moone, but on both occasions he dragged his shot wide. 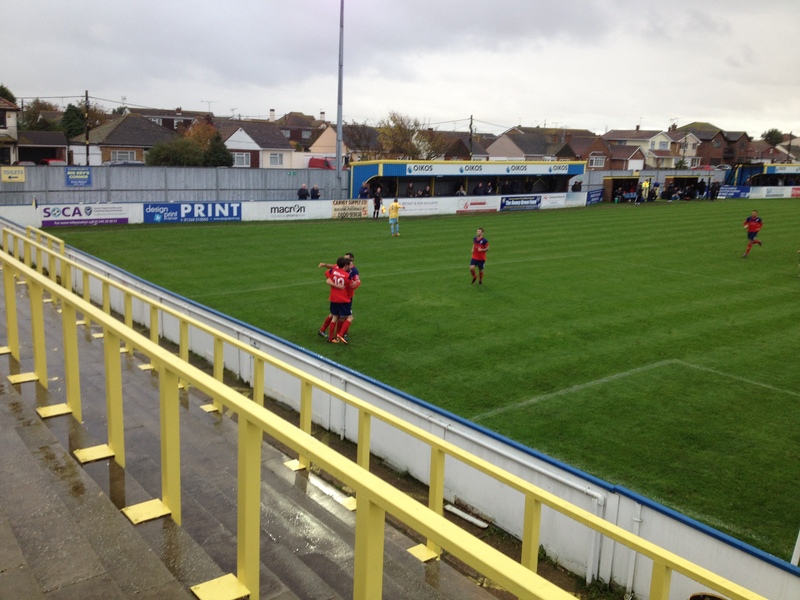 In fact, Canvey could have made it 3-1 in the dying minutes, but Chiweshe tipped over Simon Thomas’ shot. 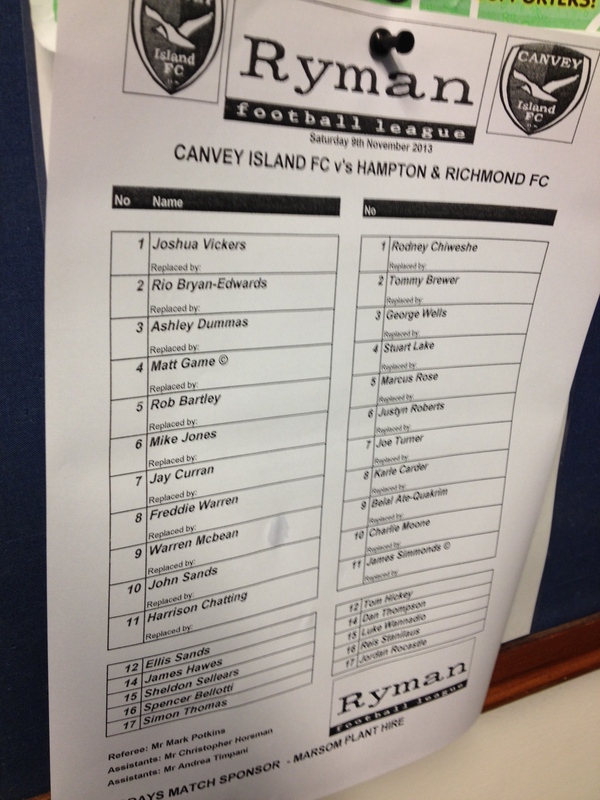 Posted on November 11, 2013, in UTL Archive and tagged Canvey Island FC, Charlie Moone, Hampton & Richmond Borough, Isthmian Premier, John Sands, Ryman League. Bookmark the permalink. Leave a comment.